Lavender Rose Handmade Soap provides a mild cleansing for dirt and grime. This soap lathers beautifully with the enriching property of pure mango butter and essential oil of Lavender. Lavender Rose Handmade Soap gently cleans and lathers beautifully with the enriching property of pure mango butter, essential oil of lavender and realistic rose fragrance. This best handmade soap is beneficial for any type of skin. The scent has pure aromatherapy essential oil of lavender with just a touch of rose fragrance for a perfect balance. Whether your skin is dry, oily or normal, buy this bar for the face or body and use it at the sink or shower. Each Lavender Rose soap has been painted by hand. The rose has a soft pink flower with green stem and leaves. Lavender has a purple bloom with a green stem. This batch has a wonderful balance of oils like olive, coconut, palm kernel and castor to make it mild, creamy and gentle on any type of skin. 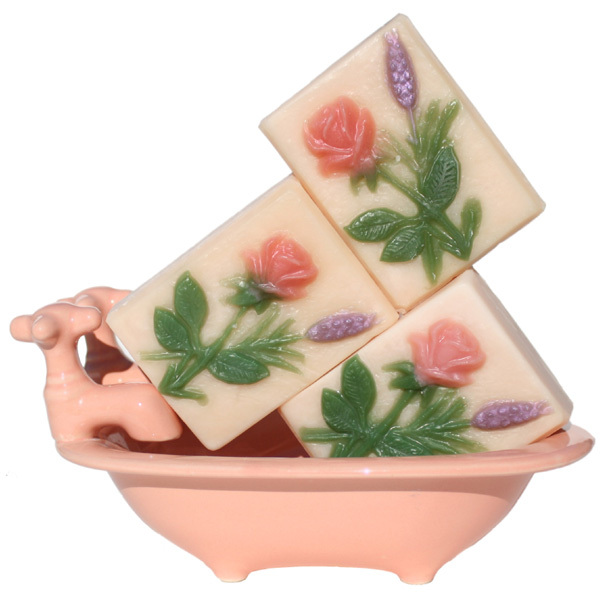 Lavender Rose soap is cured to make it mild and the water used during the soapmaking process evaporated. To help extend the shelf life of your handmade Lavender Rose soap, keep it in a soap dish that drains and out of standing water. My handmade artisan soaps make wonderful gifts as they are ready to go in a paper soap box with a complete ingredient label. Take this soap in the shower or bath with you and you might not want to leave. Some of my customers leave an unwrapped bar in their clothes drawers and linen closets to make their clothes or bath towels smell fragrant too. Ingr: Olive oil, Coconut, Palm Kernel, Mango Butter, Castor oil, Soybean, Sodium Hydroxide, Beeswax, Lavender Essential Oil, Fragrance, Sodium Lactate, Mica.